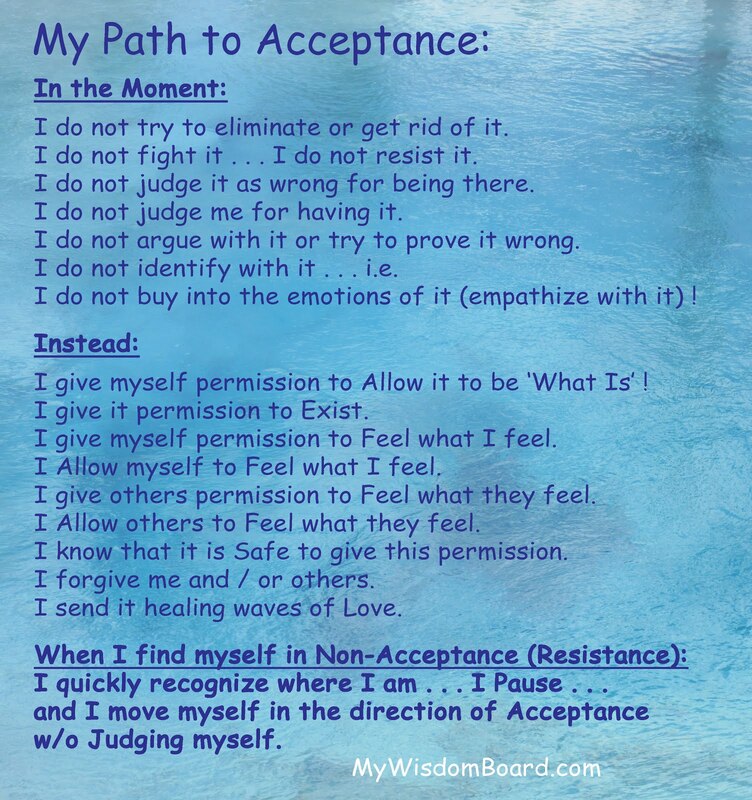 My Wisdom Board Blog : Acceptance . . . Will set me Free ! Acceptance . . . Will set me Free ! 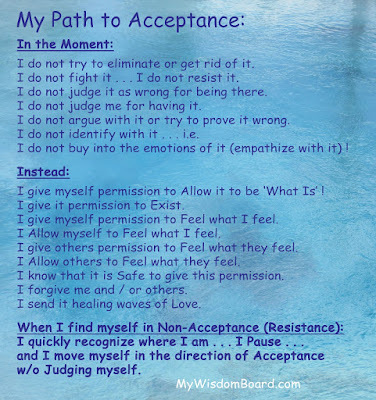 Acceptance is a powerful tool to RELEASE or prevent unhealthy, heavy emotions (Vibrations), so we can Allow 'what is'. Non-Acceptance is a form of Resistance that we hold as a result of judging something as ‘Right or Wrong’. Unfortunately many people cling to their ‘right’ and / or their ‘responsibility’ to hold on to non-acceptance because they feel that somehow it would be ‘wrong’ to accept something they believe to be wrong. They inaccurately belief, by choosing acceptance they are condoning or supporting what they are accepting. Furthermore, they tend to believe that this acceptance means that ‘it’ would stay as ‘it is’ indefinitely, when in truth it is often just the beginning of allowing a beneficial shift to take place within us. These misperceptions often result in unhealthy energy patterns that get repeated in some way until we recognize them, and we realize that they do not serve us. At this point we start to see that we must change them from within us if we want to move forward. We are only accepting ‘what is' . . . that we can’t change . . . in this moment. We realize that resisting what is out of our control is only feeding the power it holds over us. On the other hand: When we allow ‘it’ to be ‘what it is’, and then use our skills to the best of our ability to move us in a positive direction . . . then we are the ones who stand in our own power and we are consciously creating a better outcome than what it would otherwise be. The most important and most often missed reality about Acceptance, is the same as it is about Forgiveness: Acceptance has nothing to do with others . . . it is all about us ! It is about the perceptions we hold and the resulting choices we make about how we want to feel and live our life. Acceptance, like Forgiveness . . . will set us Free of unhealthy, heavy emotions that do not serve us and it will pave our path to greater joy and happiness . . .
if we Accept it and Allow it ! I will not take certain action in an attempt to improve something going forward. I resign myself to something being as it is forever (i.e. it does not mean that I give up). I ‘Approve’ of or condone what I am accepting. I accept ‘What Is’ . . . in this moment . . . allowing to release any Pain and Tension (Resistance) that causes dis-ease. * There is Divine Order. * Everything is as it should be . . . in this moment . . . for whatever reason . . .
even when I do not understand it and it appears otherwise. * Everything is working out for everybody’s Highest Good . . .
even when I do not understand it or it appears otherwise. approving, liking, condoning, or reacting to it. * I am . . . or I will do what I can (or must) do in an attempt to better something. * It is my task to learn new skills that help me grow and expand for my Highest Good.